USD2.50* for the destination of your dreams! … in my experience, it would usually involve an over-dependency on various social networks (Facebook and Twitter, mostly), the need to be up and about at ungodly hours to catch seat sales when they drop, then a protracted battle with the airline website to get cheap seats for both inbound and outbound trip, then finally — a bit of haggling with the Gods of Travel praying that your unpaid credit card can accommodate the cost of ticket for two! I don’t know how you choose to travel, but for budget travelers like me, I usually travel through the graces of cheap airfares courtesy of the country’s largest airline, Cebu Pacific. Through the available seat sales, I was able to see the beauty of Seoul and Taipei (as well as Singapore and Hong Kong) which I never thought was possible before without selling my kidney to buy airline tickets. Currently, my latest obsession is to see Japan during my birthday week in May. Ideally, I would have wanted to be there on my birthday, but the so-called battle with the seat sale has made me book the day after (which was selling for PHP99 only). 1. Pray that your favorite airline will offer cheap tickets for the period. Unfortunately, the only consistent airline to offer free tickets anywhere is Cebu Pacific. 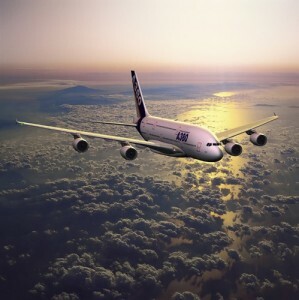 The company usually have monthly deals promoting the different destinations where they fly. Available deals can be as amazing (and unbelievable) as the Zero Peso sale (yes, you only pay for the taxes) and the Piso (1peso) Sale. I haven’t had the pleasure of scoring any of the two, but I was able to book tickets to HK for just PHP3,000 RT, while my sister got her Korea tickets for only PHP3,500! So, yes — this is definitely cheap! I know that the national carrier Philippine Airlines have Monday Promos while JetStar and AirAsia also offers cheap fares depending on the destination. However, Cebu Pacific still remains the undisputed budget carrier. Yes, I have to point out that understandably, there are instances when the service given by CebPac leaves much to be desired. It’s either you get a bad service or good service. And yes, the airline seats are small — a Great Dane will have problems trying to fit himself. Plus, you will have to pay for almost anything: extra check in baggage, in-flight meals, seat preference, the list is endless. 2. Make sure to follow the carrier’s social media account. In my case, I follow all mentioned airlines in Twitter and Facebook. Make sure to check their feeds once a day! 3. Never swear off 12 midnight — that’s when price drops usually for Cebu Pacific. In my case, I was able to score my latest return trip when I woke up unexpectedly at 3AM and decided to fiddle with Facebook on iPhone. Saw the ad above and lunged for my laptop like mad. 3. Have everything handy and easily accesible – that means your passport and credit card. Remember, time is of the essence. How sure are you that at the very moment somewhere, another crazy lady is also trying to book the exact flight to Tokyo! 4. Make sure to play around the available travel dates to get the deal you want. 5. Make sure you have enough money to pay for the ticket. The only downside is that due to the excitement, I was awake until 6AM just giddy due to the fact that I scored cheapo tickets to somewhere (yes, I am crazy!) that I never had the chance to sleep. Fast forward to 10AM — imagine me trying to stay awake during a boring departmental meeting. I know, I am missing two days of my photo project. 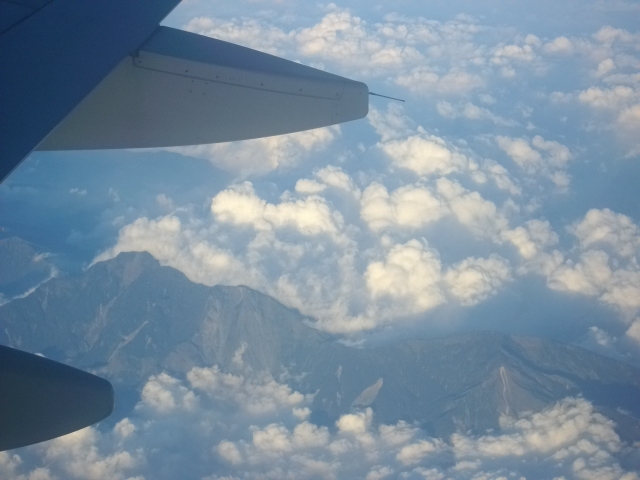 But I can’t help but share the photo above — that’s the mountain ridges of Taiwan. Apparently, you fly over Taiwan then Osaka before you reach Busan. WOHboy…we Pinoys really had to take it much further…. After all, while we have to admit that this gimmick by CebPac is a bit trite and tacky, we must admit that the dancing FAs got the attention of the passengers to take notice of the in flight safety demo. Normally, this is the part of the flight where passengers (me, included) would start looking at the ceiling, at the in flight magazine or at the hunky passenger across the aisle, ANYWHERE that is–except on the ongoing safety demonstration which was vital in case we have to start saving our asses 40,000 feet above ground. These guys were already dancing even before the “dancing craze” began in the Philippines. Read: dancing prison inmates, dancing FAs, dancing grocery baggers, dancing cops… From what I remember from the company orientation I had back then, these guys were dancing as early as ten years ago, when the head porter noticed that porters were just milling about when the ship is yet to sail or dock. I knew these guys personally and I’ve seen them practice their routines a hundred times. Think: a heavily-tattooed macho-looking mustached (yes, all the cliches) guy grappling with the steps of “Buttercup”. And please, throw your stereotypes away, these guys were also some of the kindest human beings I had the pleasure of knowing. Yes, these are dancing whatever from SEAir (another small carrier from the Philippines). I say whatever because they obviously don’t look like flight attendants, more like hired models. While the Dancing FAs from CebPac was at least interesting and enjoyable to watch, these girls make me want to cringe — first, their performance is uber boring (a few shakes, sway and clap), second — why do I have this nagging feeling that the performance felt forced and contrived and lastly, the extra bitchy part of me was throwing snide remarks on how it looked like a really boring girlie bar floor show on air. Come on, SEAir Marketing & Promo guys, this is the best you can do? If you’d resort to copying Cebu Pacific, you might as well do something really cool and impressive. What should I expect next? Dancing train station guards? 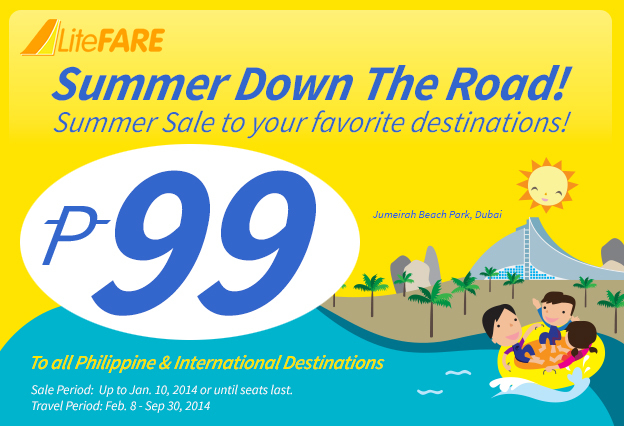 Great Singapore Seat Sale at Cebu Pacific! 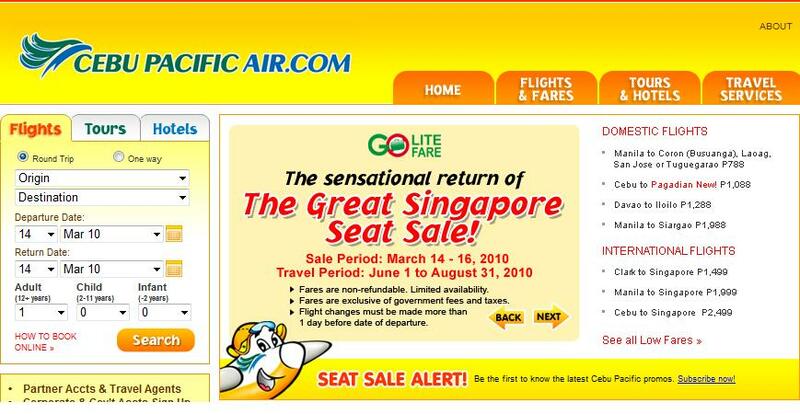 And so, the airline that made jetsetting possible for money-piching folk like me, Cebu Pacific, has announced the “Great Singapore Seat Sale”, obviously to coincide with the Great Singapore Sale happening from the May 28 to July 25. Hmmmmp, I again bemoan the lack of serious funds on my bank account. Me and the hubby is looking forward to our SG trip this year and while we do it every end of the year, being in SG during the time of the Sale would be really, really fun, no? It’s the time of the year again when I become agitated and start searching for new surroundings. I was just overseas two months ago, and now I am itching to travel once again. That is why I am always broke, that’s why I don’t get to save money. It’s because for every measly sum I get to save or earn, reflex points me to the Cebu Pacific website to book for the nearest overseas trip my money can take me. Then I’d go to Asia Travel for the cheapest hotel room I can find. I hate being stuck in a place. I love discovering new places and meeting new people. My fondest wish is to win the lotto and spend money traveling. I don’t dream of owning new cars, but I salivate thinking of backpacking my way across Asia. If only money is no object, I’d be updating this site somewhere in Singapore. I am bored. I am going crazy just having to sit here 9 hours in day, working. If only I have the money, I’d swear to God, I’d be traveling my whole life. I don’t care if I don’t have all the riches in the world, the knowledge I get from seeing new places and experiencing new culture is worth it.